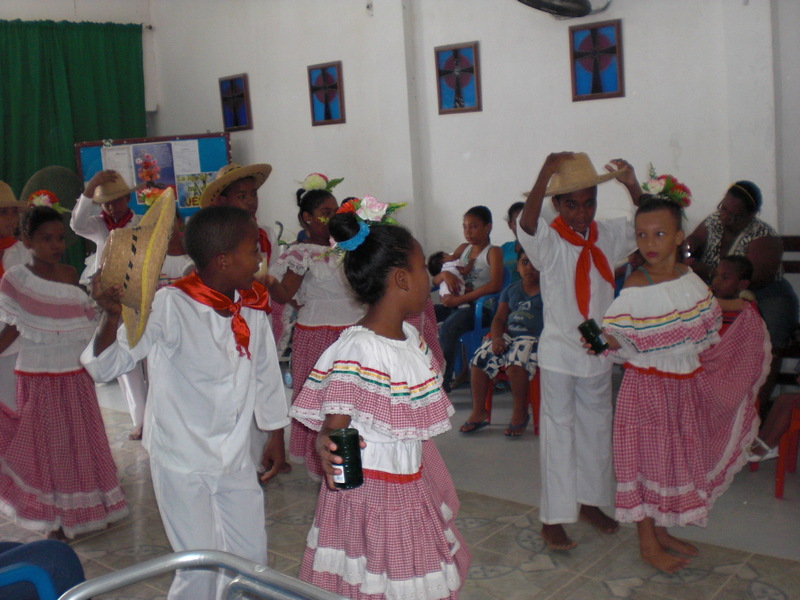 The service was part of a large festive celebration for Holy Cross Day (Santa Cruz). The church was bursting with people and activity, and one side of the sanctuary was filled with young people of all ages. 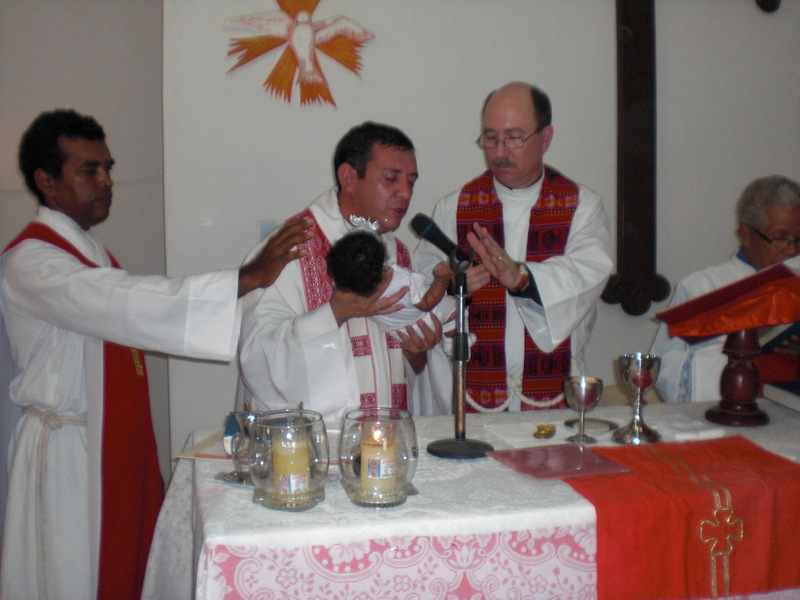 During the service, as we were concluding the Sanctus an elderly woman rushed up to the altar holding a baby. She indicated that the mother was not feeling well and needed to leave, but wanted the child to receive a blessing. So, we offered a blessing for the baby, after which 3 more mothers showed up at the altar holding infants they wanted to receive a blessing. No one seemed to mind that we stopped in the middle of the Eucharistic Prayer or that we were doing blessings at the altar. What’s more, when we resumed it was as if we never stopped for the blessings. 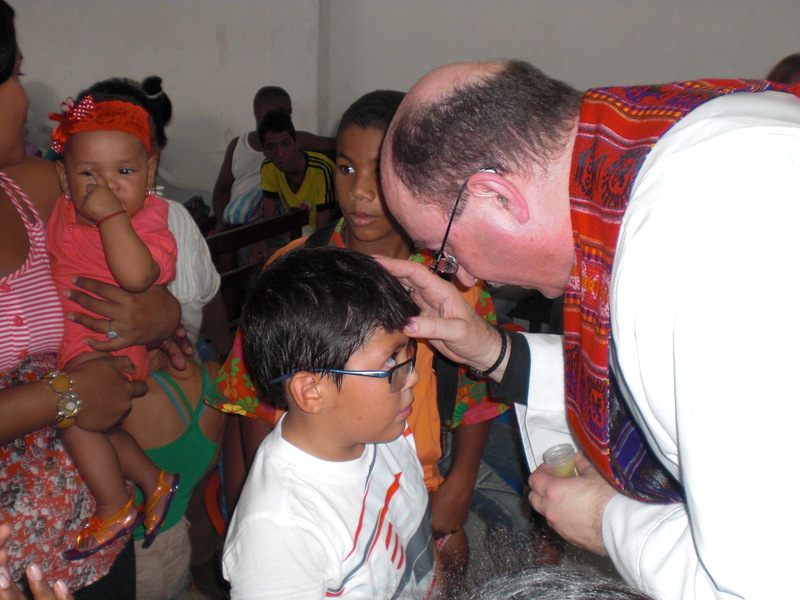 After distributing communion, I was tapped on the shoulder and handed a vile of holy oil and the children started to line up in front of me for a blessing. As the end of the line of children approached, adults started getting up and joining the line. Even a couple of elderly women who needed assistance to stand came up for a blessing. As part of the day’s festivities, after worship we were entertained by a youth dance troupe that has become one of the church’s flagship youth programs. It provides an alternative for the children to drugs and violence in the streets, as well as provides them with an opportunity to learn about their culture and heritage. 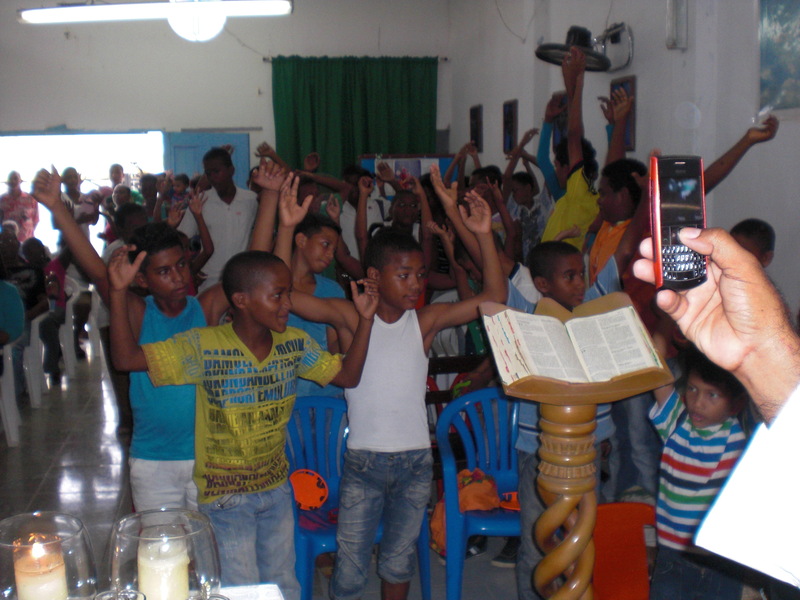 The program was started by a retiree in the congregation who wanted to do something for the children. After the dance program we were served Sancocho, a traditional Colombian soup made with many kinds of meat (most commonly pollo (chicken), gallina (hen), pescado (fish), and cola (ox tail)) along with large pieces of platano (plantain), papa (potato), yuca (cassava) and/or other vegetables such as tomato, scallion, cilantro, and mazorca (corn on the cob), topped off with a squeeze of fresh lime. As I reflect on my time in Cartagena, the impromptu aspects of worship here, and on the many places where I’ve served where a plastic table, a pile of plastic chairs, and a simple candle were the supplies for a community’s standard Sunday worship, I think about serving as a priest when I return to the US. I find myself pondering what practices will stay with me. I wonder how it will feel and how I will perceive myself as a priest, serving behind a traditional altar in the US rather than making something at hand into an altar. Will my experience serving in Colombia become my new “normal?” Will everything in the States begin to feel to me like “high church?” Will I be happy with my worship experiences in the States? What parts of my experience will I incorporate into who I am and will be, and what parts will dissipate with time? As I reflect and ponder these and other questions, I find it interesting to note that they don’t raise concerns, but rather fill me with a sense of excitement about the future and about my life in the church when I return to the States. I sense in what you share here an authenticity, a pure and simple devotion to Christ, the clarity that Paul focused on in his ministry to the Corinthians. And I pray that you will indeed bring that back with you. Although I don’t always reply, I always enjoy your posts. This one especially comes through the net as entirely “Ted”. Your love of people, all people, and Jesus is always an aura around you. And it looks like your time in Columbia is just deepening it. What a compliment, to be described as “more Colombian than German” (or American! )… God is surely walking with you and with those you serve, Ted, both here and abroad. Muy gracias! Hey Ted, I check your blog every once in a while. Never thought about the German side, but it makes sense now that I think about it. We so need the warm Latin influence to the faith.